I am a happily married mum to 5 children, we own a large cropping farm in Victoria, Australia. 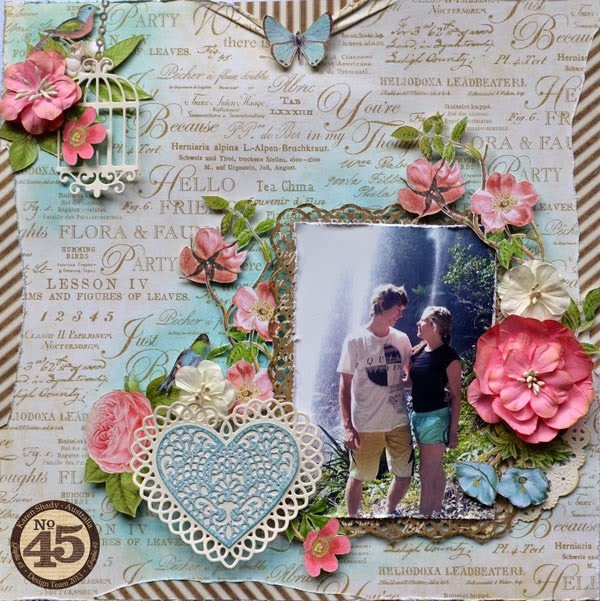 Scrapbooking is my 'happy place' and this is where I share my creations. 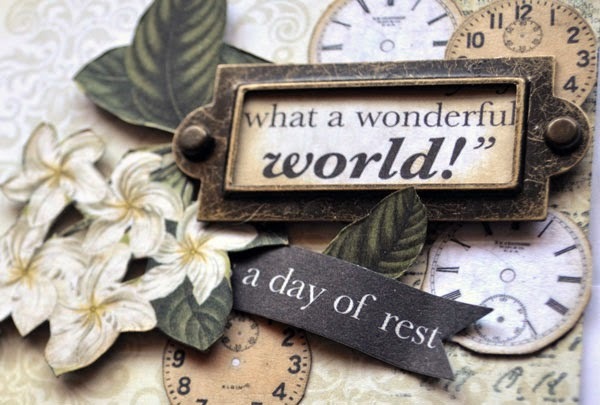 Thank you for visiting, and please stay a while and look around. Hi there... Today, I have the most adorable photos to show you... My son Samuel, and his beautiful partner, Sharnee had a baby girl in February... We are all so excited about this.. We have lots of boys in our family, I have 1 daughter, and 4 sons, and my daughter has 3 sons, so, the birth of a little girl , and all that goes along with that, is just awesome.. 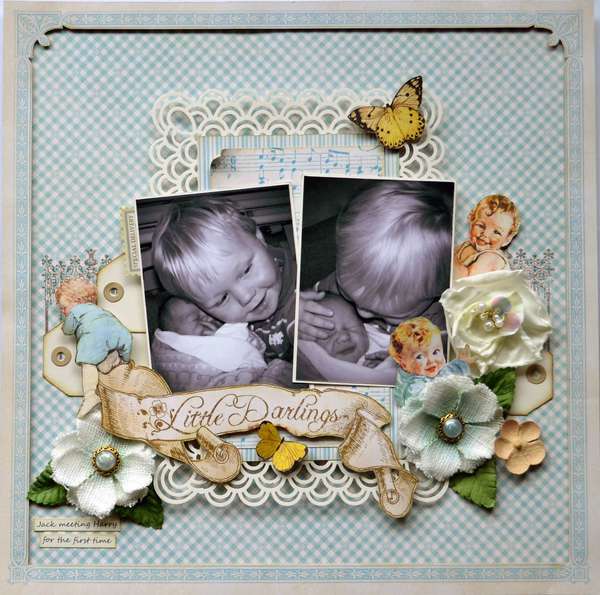 I cannot wait to start scrapping some little girl layouts. I think I have used every single photo I have of my daughter at least twice each over the years (probably more) so am very excited to have a new 'model' to scrap.. 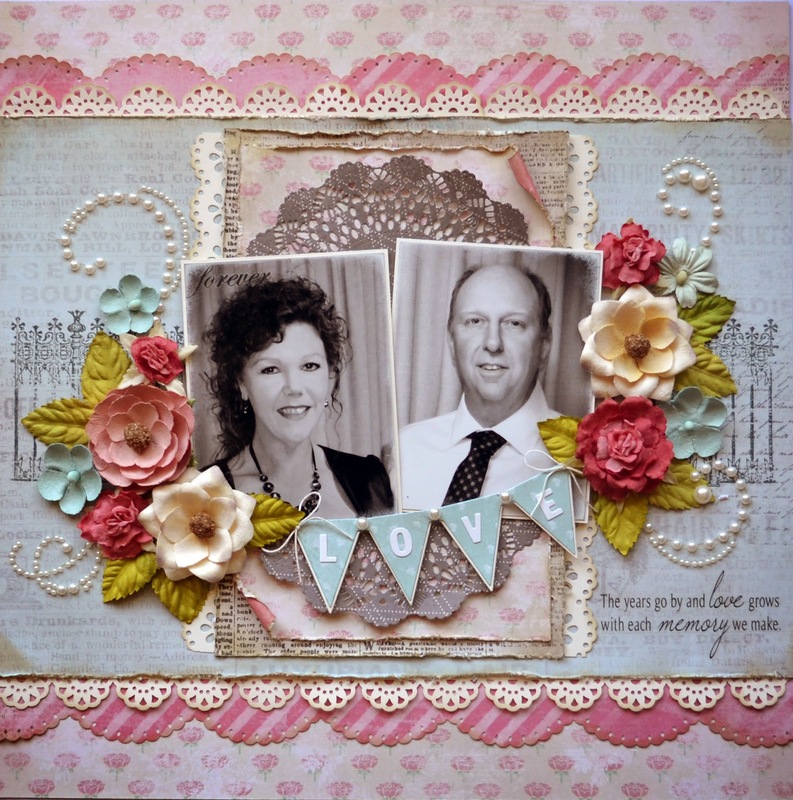 I also have a layout to share, which I did for Kaisercraft a little while back.This photo is of little London's mummy, and Daddy.. Thanks for calling in today.. 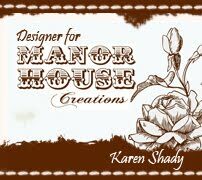 I have more projects to share with you, in a week or 2, so be sure to call back in then. 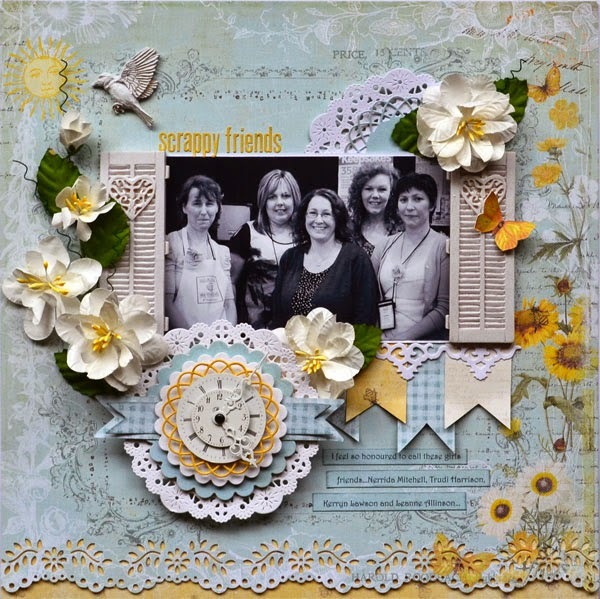 PLUS, I have some news about our upcoming Scrapping with the stars retreat... but, more on that soon..
Today, I want to share with you a few of my favourite projects I've done over the past little while. 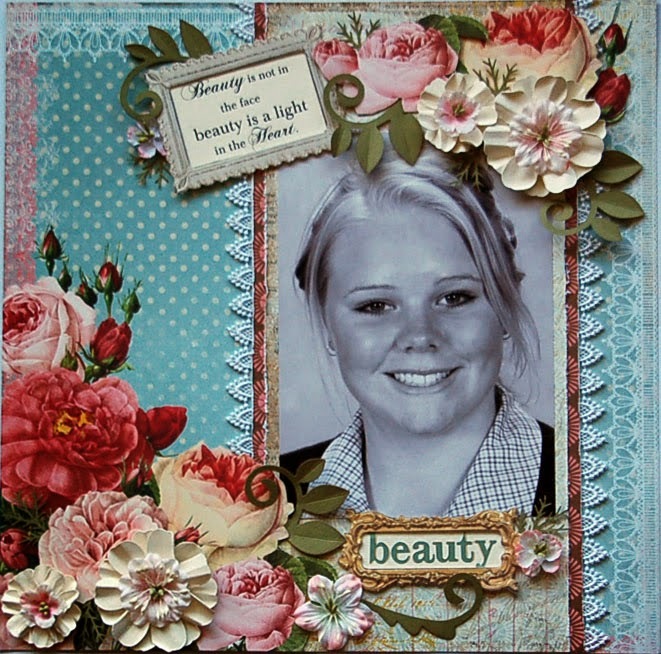 I am trying to sneak under the radar with the fact that this is my Prima DT application.. arrgghhh.. The first 3 are projects I haven't shared before. They all have 1 thing in common, lots of Prima loveliness. 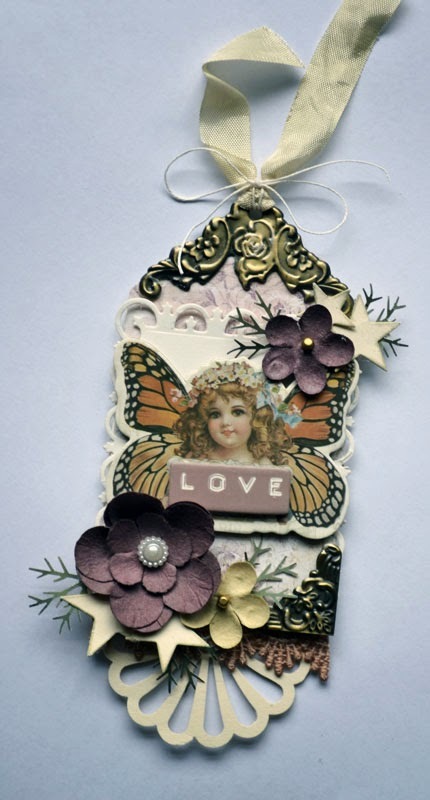 Firstly, I got me some of the gorgeous new Prima Butterfly collection.. (papers, chipboard and flowers) All of which I adore. 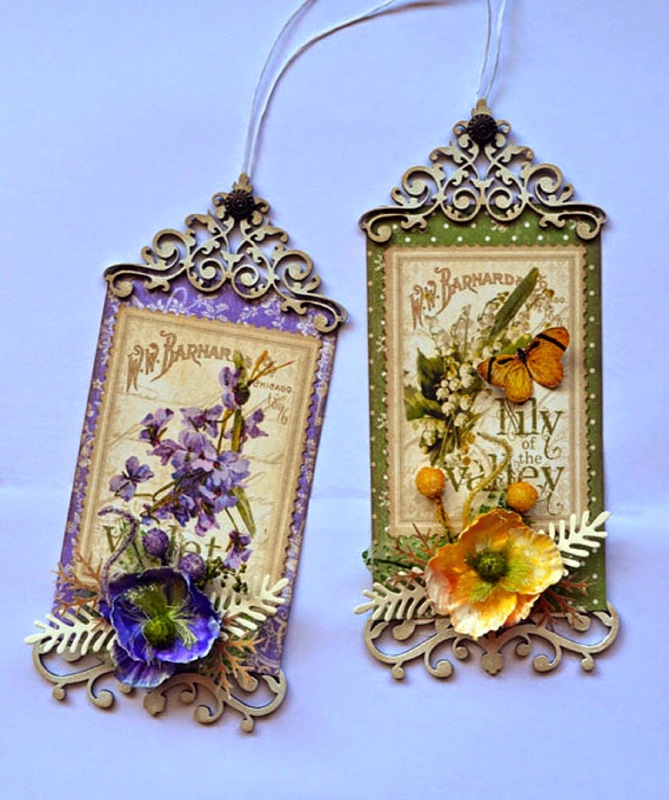 I made a cute little tag. The Prima Sun Kiss range would have to be one of my all time favourites. 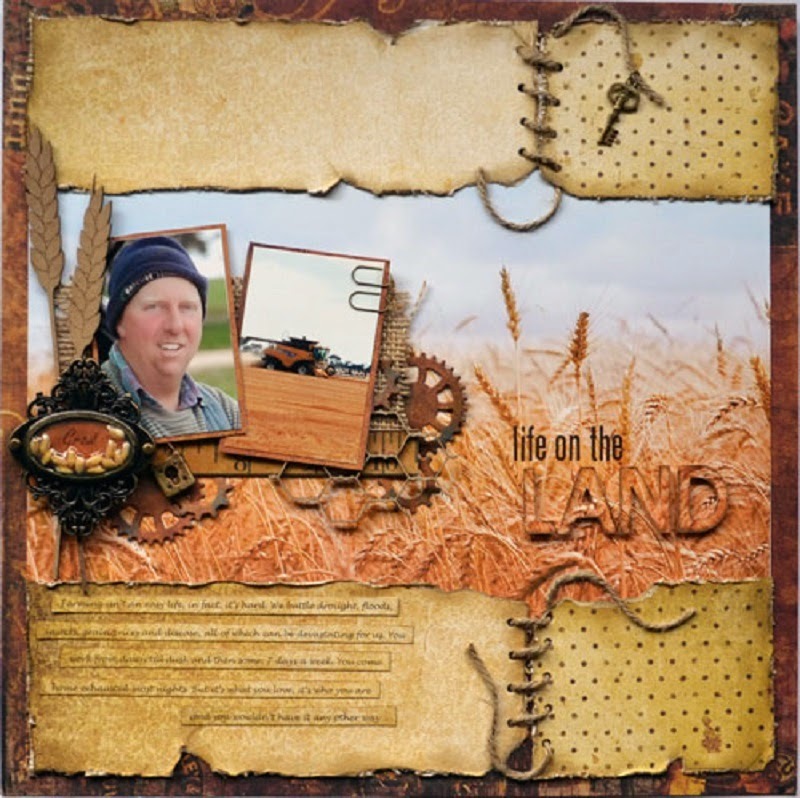 Perfect for our farming background, but still suits my shabby, girly style too. 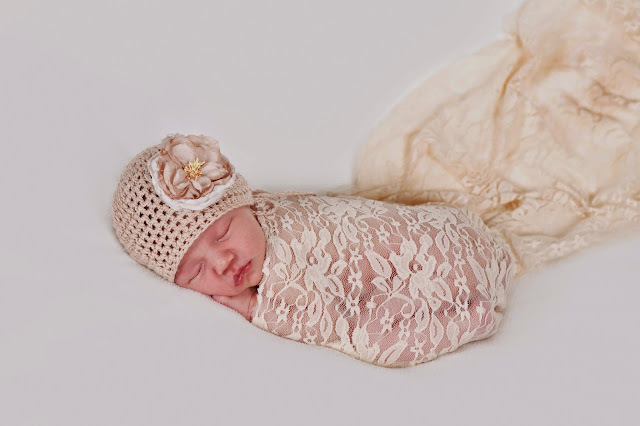 Another favorite.. Prima Madeline.. 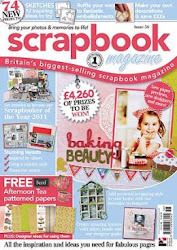 I have a stash of this still, it is in my 'too good to cut up' box.. Please tell me there are others out there who do this. 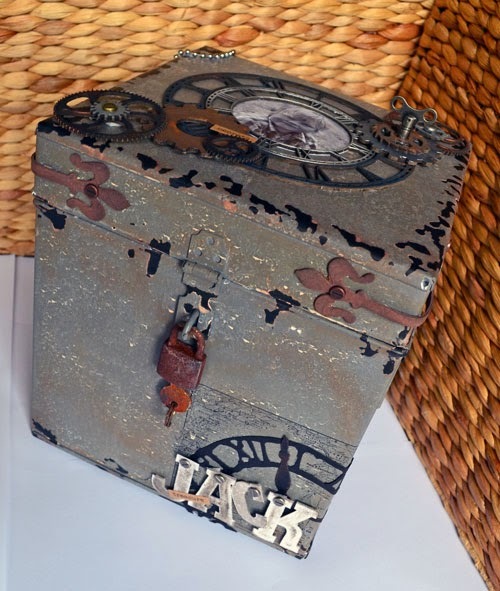 I had a bit of a play with Mixed media for this metal box.. Lots of ink, paint, rusting powder, metal, and even some salt. 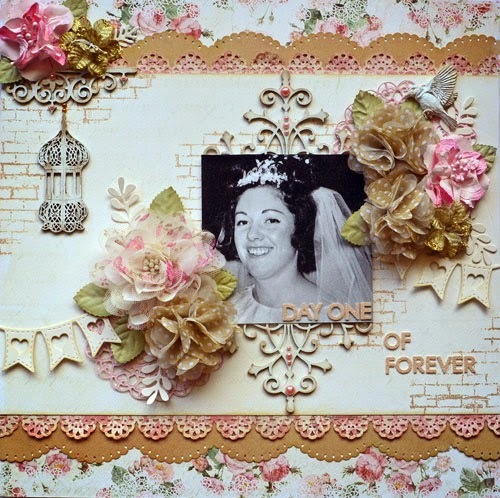 Had some fun with Prima chalk inks here. I just love the soft look these chalk inks give. Hi again... I just had to call in and share this really cool news. 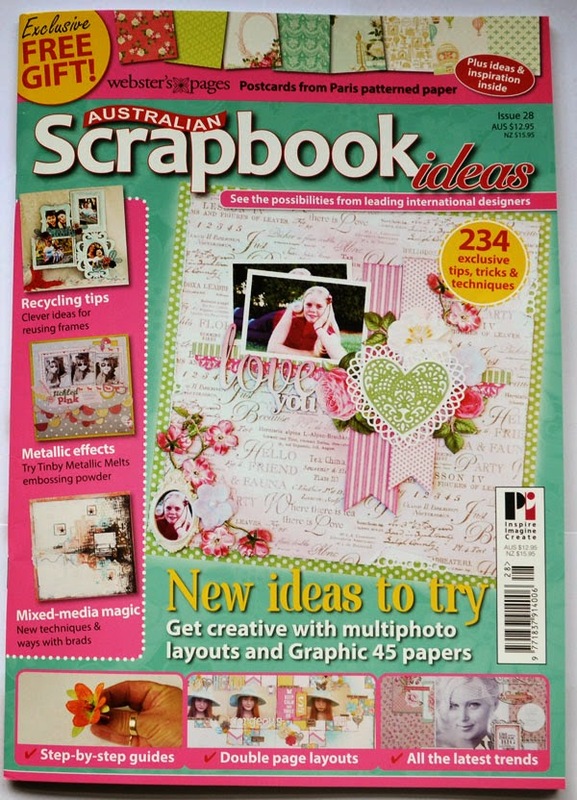 Australian Scrapbook Ideas magazine came out this week, and I am so stoked to say, I have 7 projects published this month. a HUGE THANK YOU to the magazine for the opportunity. 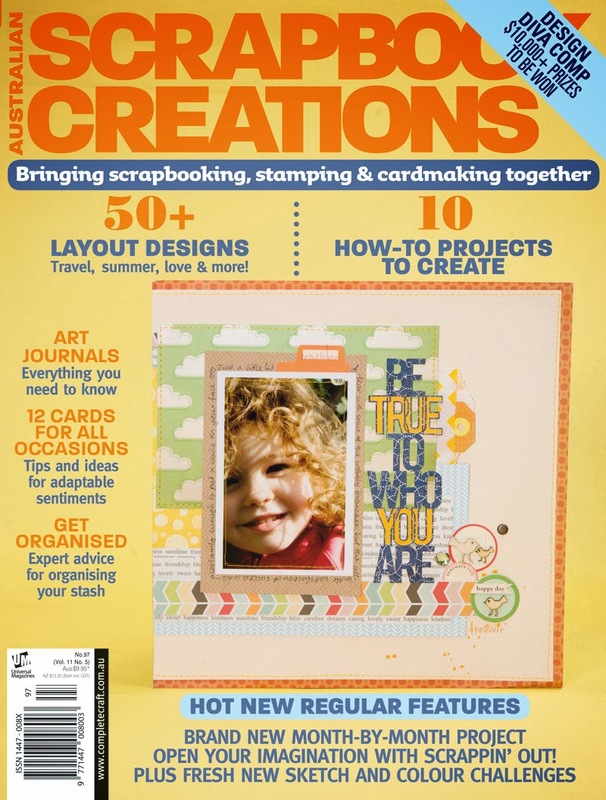 I did a 'tried and tested' feature on the Brother 'Scan N Cut', and I was also the 'ask the expert' for this issue... I tell my husband all the time that I am an 'expert', and now I have proof.. lol.. Here are the projects I did for the Brother feature. This photo makes me smile... Its of all the wonderful ladies who attended our 'Scrapping with the stars retreat' in November 2014. 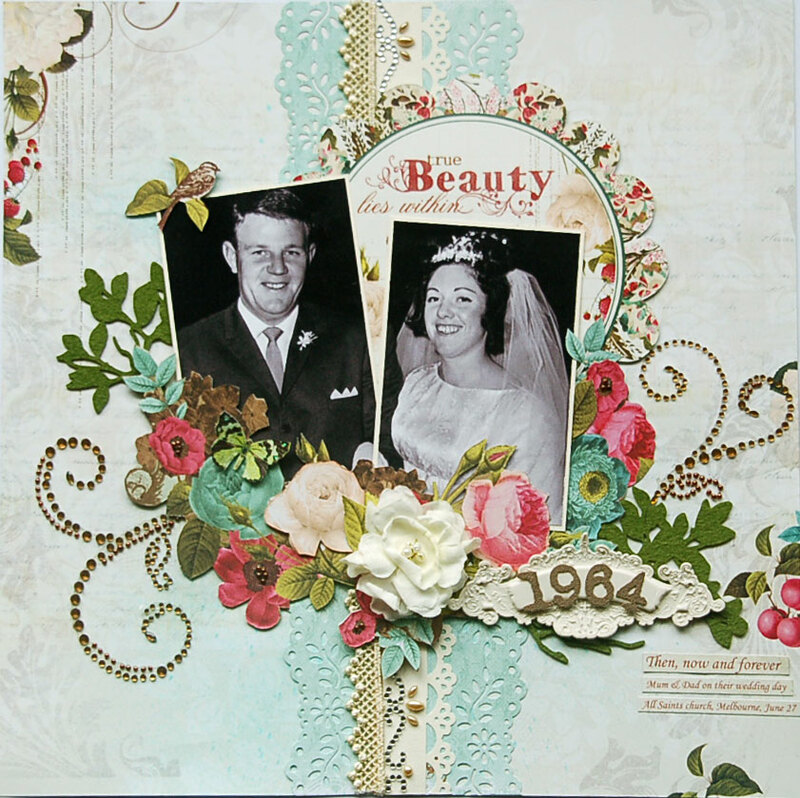 I've used lots of gorgeous Prima flowers, and of course the Brother Scan N Cut to make the majority of the embellishments. The magazine explains in detail how I made all of the following layouts. My Dad hates this photo. 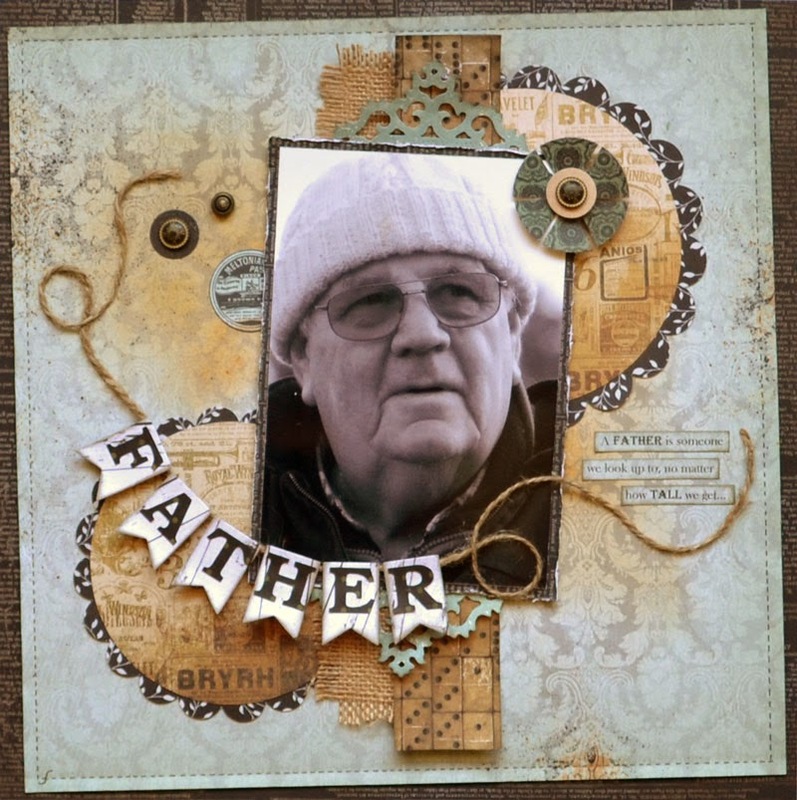 He says it makes him look like an 'old fart' lol... But, I love it. 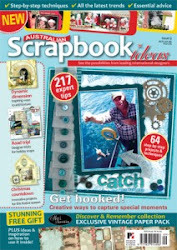 This next one is a photo of myself, with 2 immensely talented ladies.. Jane Tregenza, and Sue Smyth, the editor of Australian Scrapbook Ideas magazine. 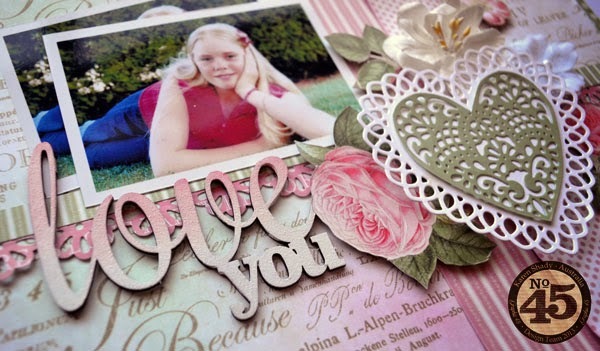 More gorgeous Prima flowers, and more cool ways to use the Scan N Cut. 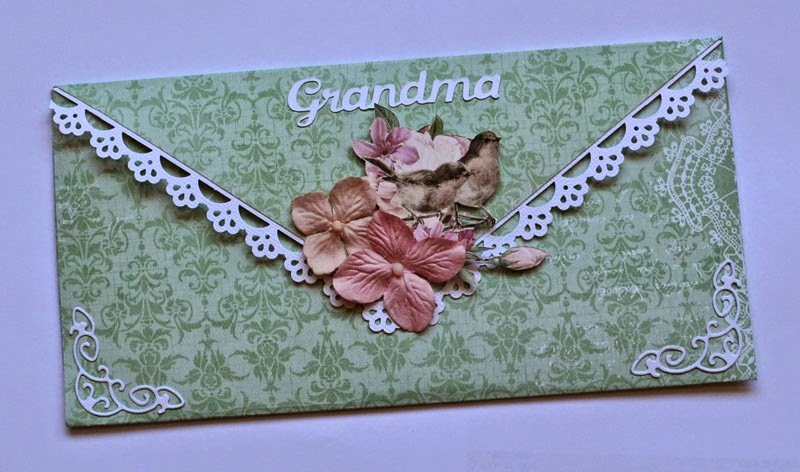 Lastly, an envelope card. I make these quite a lot. 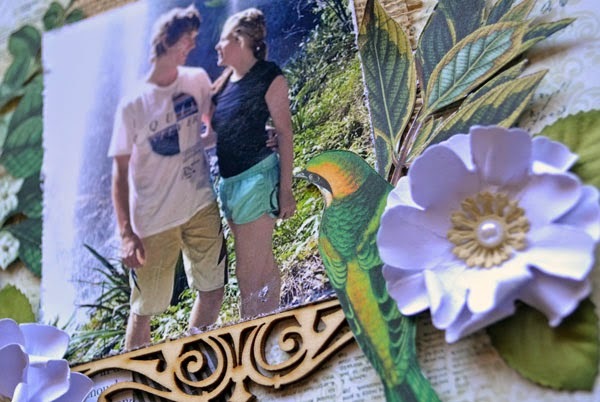 they are really easy to make, and look really cool, I think. 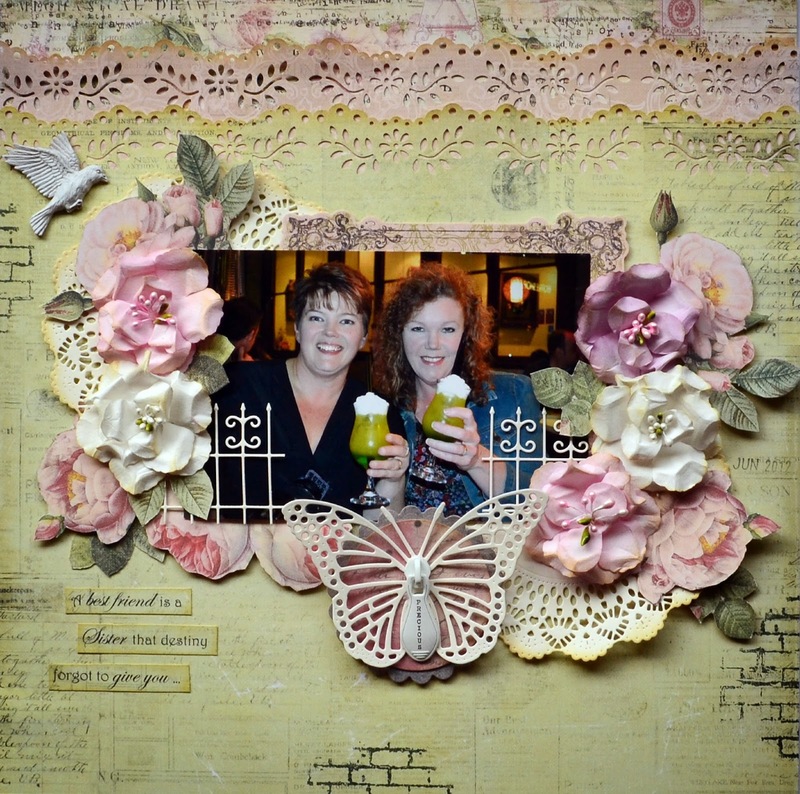 I have a couple of projects to share, which I did a little while back. Both have been published in magazines lately. 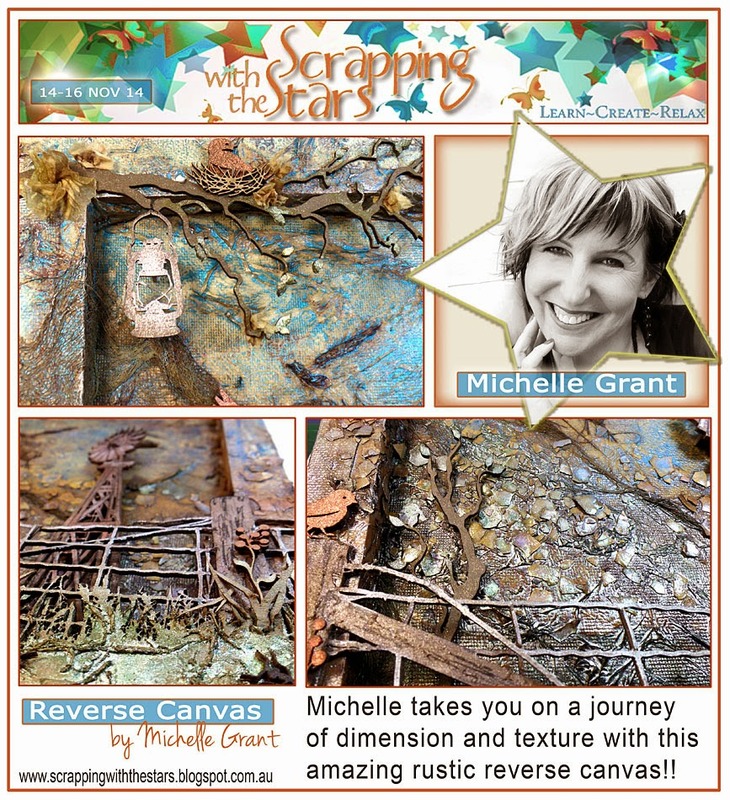 Scrapping with the stars-Retreat vacancies !! 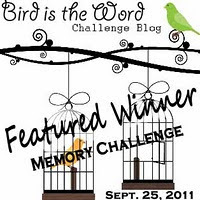 Firstly, I want to apologise for my lack of blogging !! 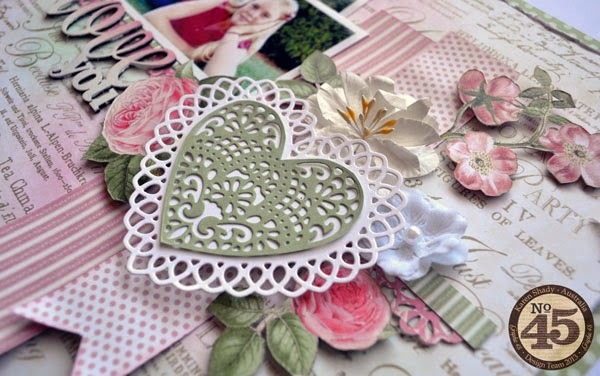 My poor little blog is looking very neglected.. But, I do have a good reason. I have been flat out, organising the 'Scrapping with the stars-retreat', which is this coming weekend, 14th to 16th of November. 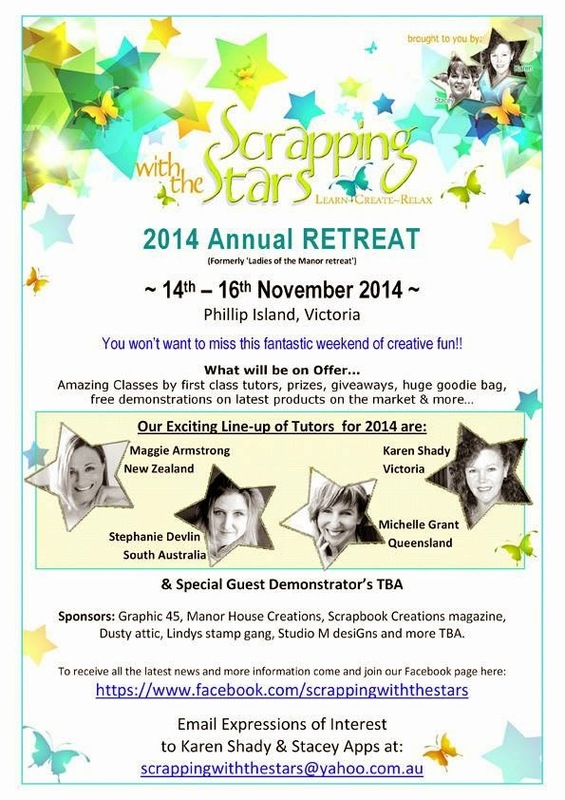 Our Scrapping with the stars - retreat is on Phillip Island, in Victoria, 14th, 15th & 16th of November... Visit HERE for all the details.. there are still places left, and there's still 9 days left to take advantage of our 'Early bird specials.. 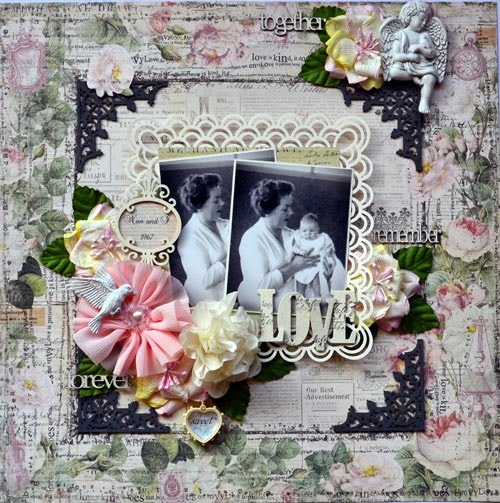 Explore the possibilities in Mixed Media with this reverse canvas. 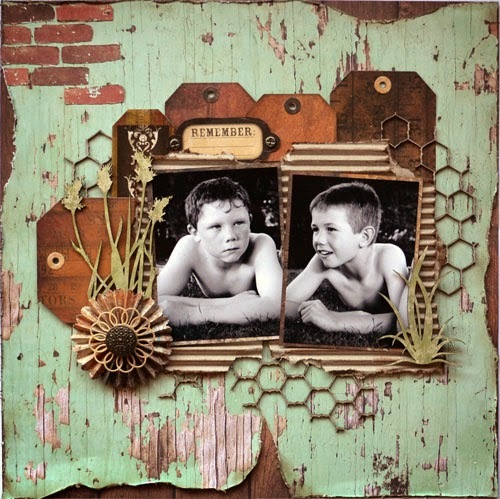 Create unique backgrounds and full of depth and interesting texture within a rustic scene. 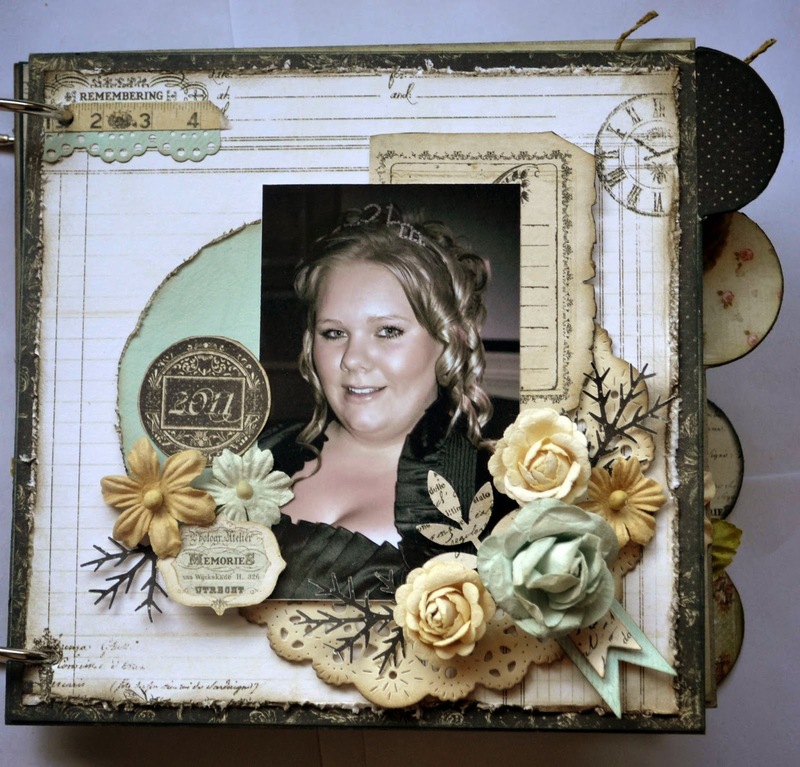 You can add a photo to this project or keep it just as a rustic themed 10”x12”canvas that you can add your favourite quote to. 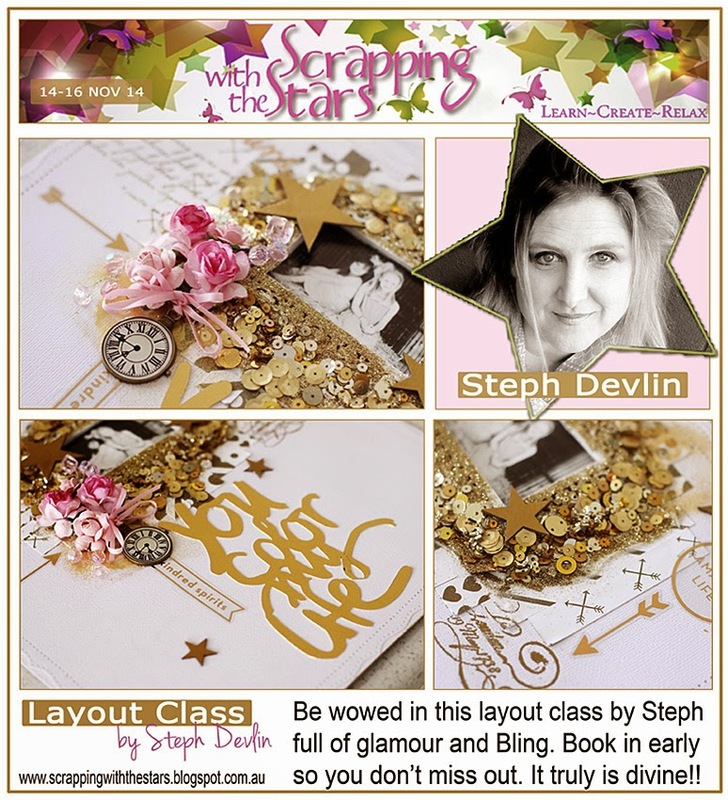 "All that Glitters is Gold" …… Be wowed in this layout class with Steph Devlin, full of glamour and bling. Steph mixes cutting edge techniques she has been taught, fused with her interpretation and style. 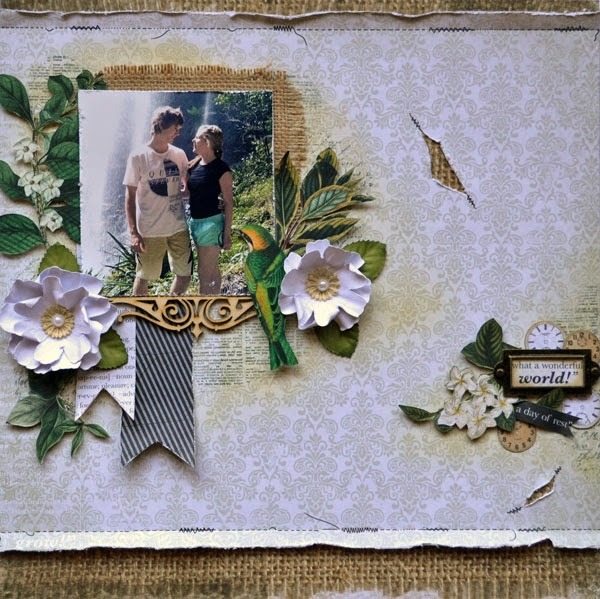 This layout as full of glitz and glamour. Book early, so you don't miss out. It truly is divine. 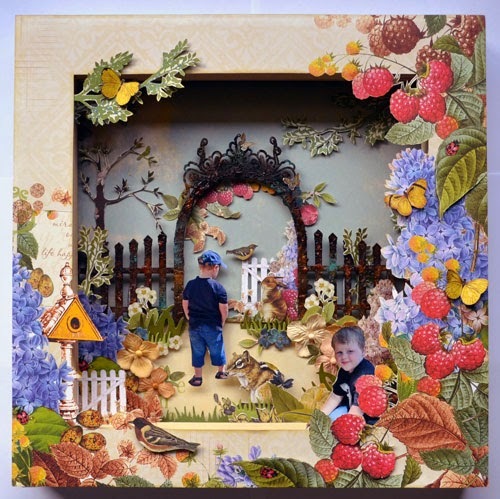 Join Maggie in her beautiful mixed media extravaganza project. 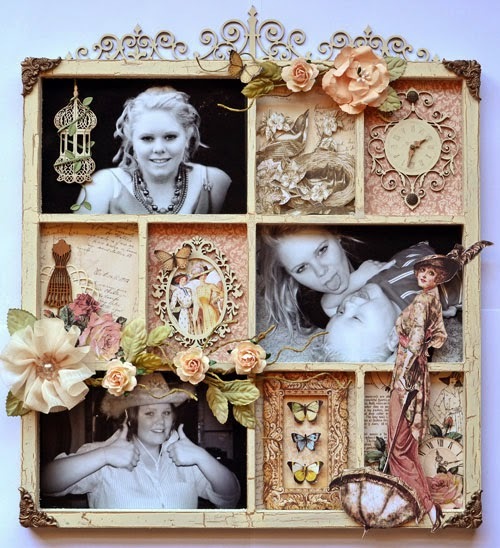 More than just a layout, this is a project you'll want to display to the world! 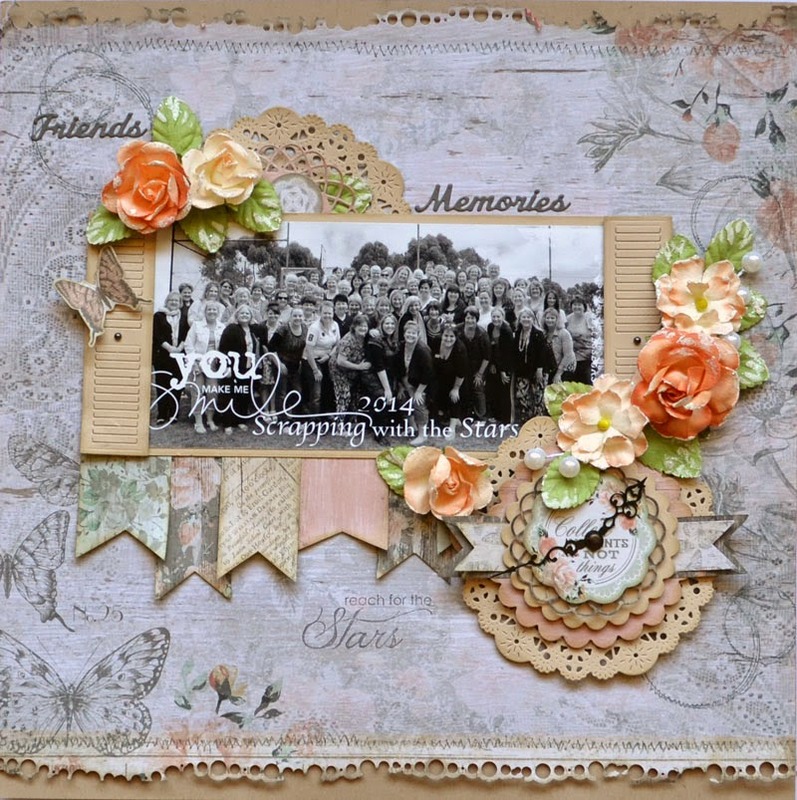 Showcasing an altered photo of that special girl in your life, you will create an ethereal piece using a custom mix of blossoms, charms and vintage laces and muslin. Upon confirmation of booking, please email the photo you intend to use to maggieben@hotmail.com. 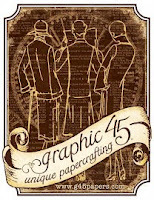 Maggie will digitally alter the background and colourings and email directly back to you for printing. This is all included in the cost of the class. 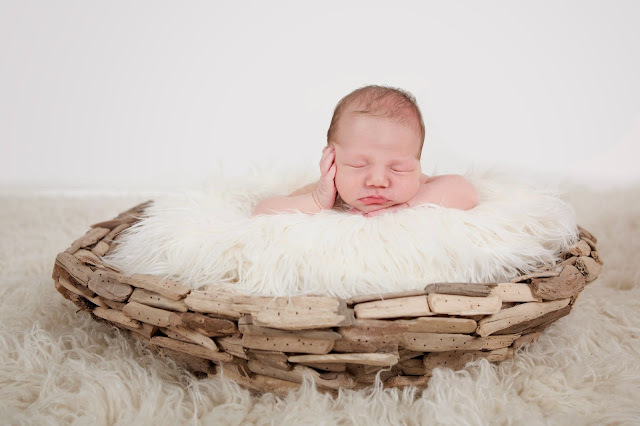 Ideally your photo will be a head and neck shot with the face slightly tilted upwards. 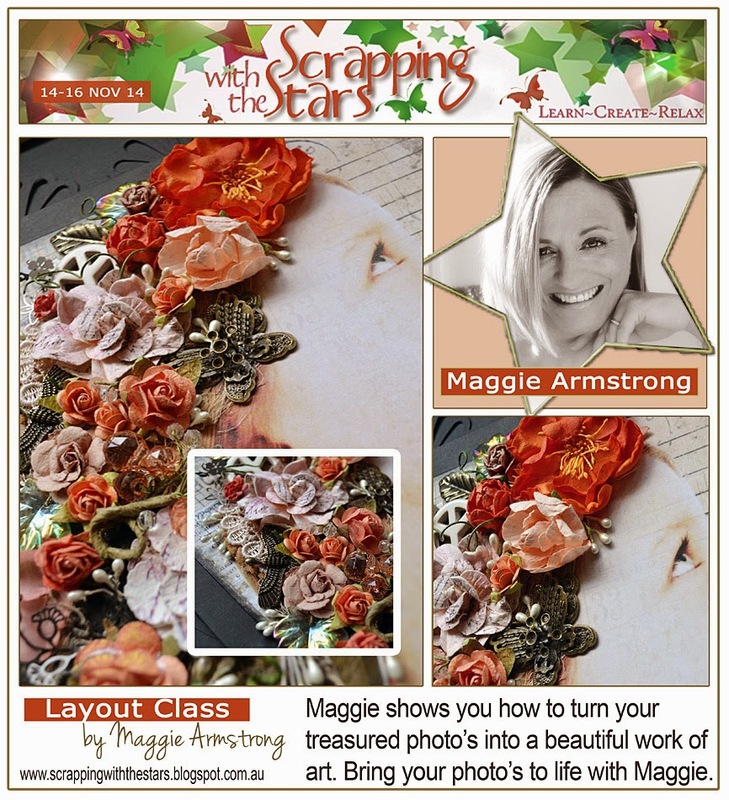 How do you book to do these classes you ask... Well, its easy, simply follow the link Scrapping with the stars retreat registration , to register for our retreat, in November. 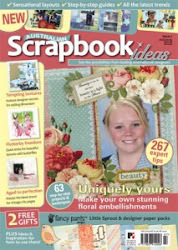 Well, I'm just a little bit excited... My layout made the cover of Australian Scrapbook Ideas magazine this month.. woo hoo.. This is the second time I've been fortunate enough to have one of my layouts featured on the cover, and both times, its been photos of my daughter, Ashlee. 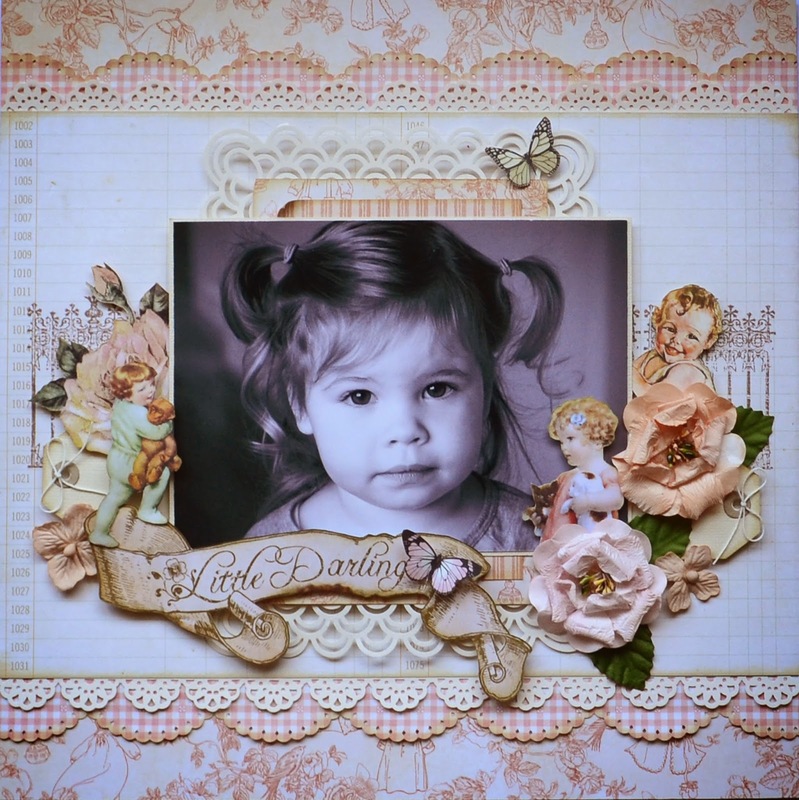 And, below, is my layout that was featured on the cover of the same magazine, a couple of years ago.. 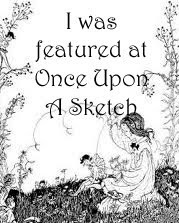 The original layout had a black and white photo, but, the magazine prefers colour photos for the cover (tip for anyone wanting to increase their chances of being published on a cover).